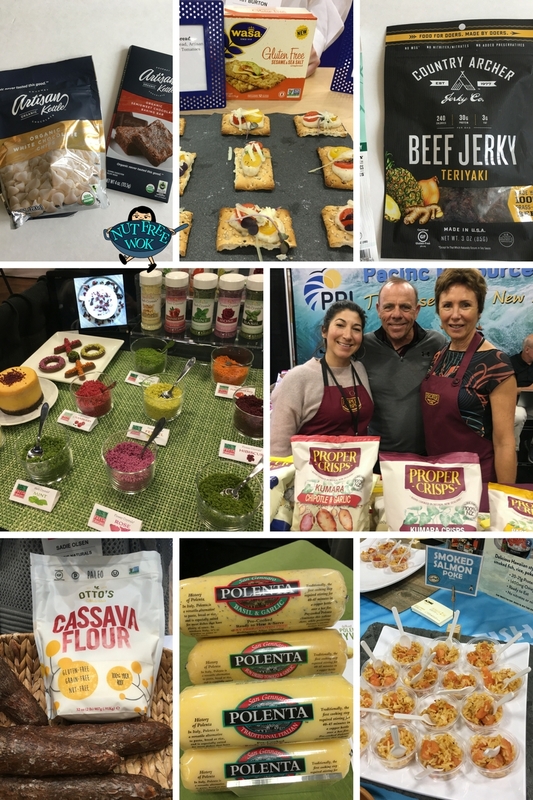 Some of my favorite brands from previous WFFS18 were back. Ocean's Halo has soy free soy sauces, Ozery has some new chocolate flavored snacking rounds. SunButter brought everything! I met Robin Koda and Maura & Justin from Fancy Pants. Aloha Shoyu has new salad dressing, Follow Your Heart has a garlic aioli vegenaise. John Wm Macy cheese crackers. 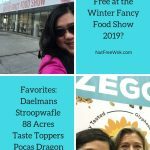 I went to Winter Fancy Food Show (WFFS18) and am reporting back with my favorite nut free and allergy friendly foods. Be sure to read about how I’m finetuning my Allergen-Dar in the last section of this post. Disclaimer/Disclosure: I have mentioned different companies and stores to share what works for my family and what I think might be helpful to readers. This post is not sponsored by any of the companies or stores and I attended the show as press. All opinions are mine. I am not sharing any medical advice, if you have any questions, please contact the manufacturers or your medical care team. There are affiliate links in this post. WFFS18 is a professional food show open to buyers, manufacturers, hospitality, etc.. It was bigger and better than previous years and after attending all three days, I still felt like I didn’t have enough time. The show organizers, Speciality Foods, outdid themselves this year. I love catching up with food companies from manufacturers from previous years and out of the thousands of people who attend, I am amazed they remember me! They are there to show their newest products which aren’t on shelves yet but as buyers place orders, you will see them on store shelves in the coming months. I also talked with a lot of new people, many who have food allergies themselves and carry epi. There is so much more food allergy awareness and when I ask some simple questions about whether a product is nut-free and 99% of food manufacturers share helpful answers so I can make an informed decision about what to share or not. Some of them have questions for me about food allergies and what we want and are there food safety certifications that we trust (please answer in the comments). There was an educational session about food safety with SQFI. The presenters talked about how food safety management is good business. A food safety recall will reduce consumer confidence of the product and will have a financial impact on related businesses. When spinach was recalled, not only did spinach businesses lose money, there was a drop in sales of croutons, bacon bits, and other salad items. It’s important to make a food safety plan to prevent food safety and food allergen recalls, to detect and respond to issues, implement the plan, and check that it’s working. If you would like to watch the presentation, a recording is available on SQFI’s Facebook page. I stopped by briefly at some of the allergy friendly booths that I’ve previously mentioned in past years to find out what’s new. Read about them from 2017, 2016, 2015 Munchies, 2015 Gourmet, 2015 Asian, 2015 Intro. Enjoy Life Foods – I had the chance to speak with Joel Wardy and he said that they will have new products to debut in March (what a tease, LOL!). Have you seen their new package redesign in teal to support food allergy awareness? I love it, thank you Enjoy Life! 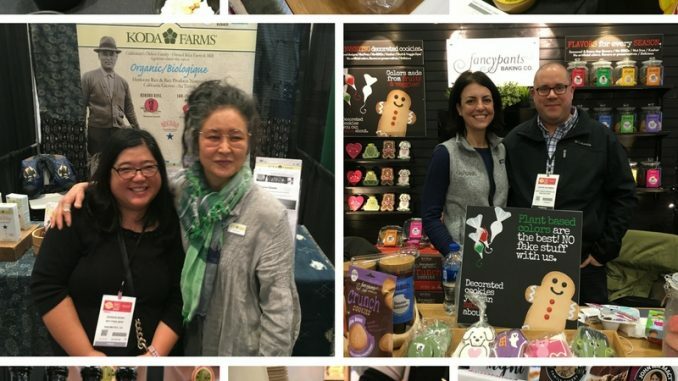 Fancy Pants – I had a chance to try an Irish Cream cookie! My family loves crispy cookies and Fancy Pants cookies are their favorite which is why I had to share a review about them recently. Kettle Pop – They are a San Francisco Bay Area company and make fresh hot kettle corn at local farmers market. The snack bags of kettle corn are good but if you ever see them at a Bay Area farmers market, try their kettle corn when it’s freshly made and still warm in a bag. La Panzanella – They make crispy crackers called croccatini and it was one of the few snacks I trusted when my son was first diagnosed. Their new bite sized versions make it so much easier to eat. I love their Dolcetini cookies. They have always been a nut free company and will mostly like stay nut free because they understand that there is a need for nut free foods. They showed me a preview of a new product they’re launching soon, I can’t wait to share. Ozery Bakery – I have written about Ozery before but they have since updated their website without any references to allergen information other than their products are vegan and kosher. I believe they are nut free, they make crackers with sesame and their meusili rounds might have sunflower or other seeds. Ozery Bakery told me that they do not store, use or process any peanuts, tree nuts or coconuts in their facility, please contact them if you have additional questions. Look for their Cocoa Cherry and Cocoa Banana Snacking Rounds, and Lavash Organic Crackers (one of the four flavors contains sesame) will be available in the US soon. Pickle Juice – I have written about them before but got more background about how did people start drinking pickle juice. There was a sports event and one team had cramps and the other team didn’t. It turns out the team that didn’t have cramps were drinking pickle juice from jars of pickles and that’s how they got the idea to make pickle juice for athletes. Seniors or other people with night cramps might benefit too. 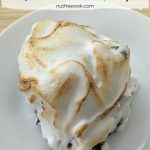 Smashmallow – still delicious, still has a slight chance of cross contact. I’ve mentioned them before with some allergy mom wistfulness and might have some good news to share later. They have a new smashcrispy snack. Sunbutter – nut free sunflower seed butter, they were super busy and I loved that there were people who were interested in a peanut butter alternative. That’s It – Their new dark chocolate covered fruit bites/truffles are such a treat! Their veggie bars are bean based but the fruit and veggies in them give the bar a good flavor. They will be updating their labels soon to indicate that their products are made in a facility free of the top 8 allergens. I love that I can find them in my local stores, Starbucks, and online (affiliate). 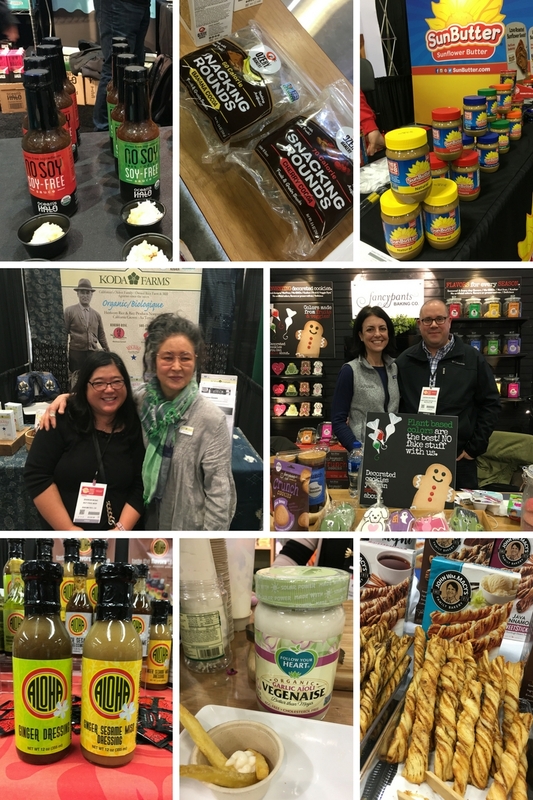 Some of my favorite brands from previous WFFS18 were back. Ocean’s Halo has soy free soy sauces, Ozery has some new chocolate flavored snacking rounds. SunButter brought everything! I met Robin Koda and Maura & Justin from Fancy Pants. Aloha Shoyu has new salad dressing, Follow Your Heart has a garlic aioli vegenaise. John Wm Macy cheese crackers. Aloha Shoyu – They are a favorite brand in Hawaii, which is useful to know that they are nut free if you ever end up staying at a condo while vacationing in Hawaii. I am excited about their new salad dressings which have simple ingredients. California Lavash – I like their naan bread a lot but I couldn’t find them this year at their show. They recently launched a new pita bread which is great for making pita sandwiches with your favorite fillings. I love their allergen labeling. Cup4Cup – is a gluten free flour blend that one can substitute “cup for cup” when adapting baking recipes to be gluten free. I had mentioned them before with a caveat about milk allergies. I’m happy to see that they have updated their labels to share allergen advisories about possible cross-contact with milk. Follow Your Heart – Their latest product is Veganaise, a vegan mayonaise that is egg-free! I also like their other products, their vegan cheese taste great and are free from top allergens. Koda Farms – I love to make sticky rice and Chinese New Year Nian Gao with their premium quality rice and rice flour. I had a chance to meet Robin Koda, one of the two owners of California’s oldest family owned rice farm and was excited to tell her how much I appreciated her for sharing her family’s story on NBC of settling in California, enduring internment camps, and carrying on their family business. Lotus Foods – I tried their Black Rice Pad Thai with a little sauce and it was delicious, had a tender bite, and absorbs sauces and flavors well. I like their products whenever I try them and I like that they support efforts to grow rice in a water wise way and to support the health and well-being of women rice growers. Morton & Bassett Spices – They don’t have any allergen information available on their website but the owner, Morton, and I have been having an ongoing conversation ever since the peanut-cumin recall in 2015 about allergen safety. I love that when we went to Big Island on vacation, I found Morton & Bassett spices in a local grocery store as a familiar and safe option. Ocean’s Halo – They are making SOY FREE SOY SAUCE and other Asian inspired sauces! That’s huge news. It’s kelp based, organic, vegan, gluten free, with no other top 8 allergens. I quickly checked the labels, talked with them about their products and allergens but more specific allergen questions require checking online and/or a follow up phone call or email. Taste and preferences are subjective and am mostly basing my observations from a sample at the show or some samples I brought home. Please read the labels and contact them with your own questions and concerns to verify for safety before you eat. My information is only as accurate as what was relayed to me by the person who spoke with me! 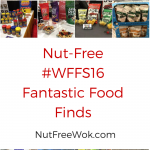 So happy to share some new nut free food finds with you! Artisinal Kettle, Wasa crispbread, Country Archer jerky, Savor Tree crystals, Proper Crisps, Otto’s Natural Cassava Flour, San Genarro polenta, and Blue Hill Smoked Salmon Poke. Blue Hill Poke Bowls by ACME Smoked Fish – premade Hawaiian inspired poke bowls of seasoned smoked fish with rice that needs to be reheated before serving. The poke bowls contain soy and sesame. ACME smoked fish was quick to reply via email that their entire facility is nut free, which is awesome because our family loves smoked salmon. Bright Fresh and Savor Tree – Bright Fresh grows microgreens that you can add to your salads or use as a garnish. One of their products is Savor Tree which is their line of flavor crystals, made from herbs, fruit, or flowers and dried with a sugar base. I found Savor Tree crystals online after I tasted basil crystals on my watermelon salad. Savor Tree crystals are free of the top 8 allergens with no chance of cross contact with other allergens. Country Archer – They make turkey and beef jerky, bars, and sticks. They use 100% grassfed beef without the use of preservatives, hormones, MSG, or nitrates. All of their produts are certified gluten free, some of their products are seasoned with tamari (a gluten free soy sauce). They don’t use any nuts in their products or their facility, but please contact them to double check. If you can’t find them in stores near you, you can order online via Amazon. David Rio – I like David Rio’s powdered chai mixes even though I don’t usually like chai, their powdered chai mixes are delicious. They use organic spices, are free from transfat, hydrogenated oils, and gluten. They are nut free except for coconut. Even though their product names are hard to figure out (what is White Shark Chai? ), I love that they support animal welfare causes. It’s possible to order them online (affiliate). Fourth & Heart – they make ghee, a purified butter that is certified gluten free, paleo friendly, kosher, and non-GMO. It’s considered a healthy fat and used as a dip or spread or for deep frying because of its higher smoke point. While their product is considered lactose free, it is still derived from milk and not a good butter alternative for those with milk allergies. They also have a chocolate ghee spread, “Our chocolate is sweetened with coconut sugar… Additionally, one of our ingredients- Passionfruit Powder- is processed in the same facility where coconuts and soy beans are. There are no tree nuts or peanuts present in our facility.” Available in stores and online (affiliate). Gardel’s Fine Foods makes Gardel’s Chimichurri and Aioli sauces and they come from Los Angeles, Carlito’s Gardel Argentine Steakhouse. I’ve never been to the restaurant but I obsess over chimichurri sauce so much, that I have a little bit of steak with my chimichurri sauce and not the other way around. Their nut free, GMO free, and preservative free jarred Argentinian chimmichurri sauce (contains soy) and aioli sauce (contains egg) that are delicious. I’m so excited that even if I can’t find it in stores, I can order it online (affiliate)! Honey Smoked Fish – They have the most amazing smoked salmon I have ever tasted. It was obviously cooked and flakey but really juicy and tender. They use hickory wood and honey to smoke the salmon. They have their own salmon farm in British Columbia and the salmon is free of preservatives, coloring, artificial flavors, nitrates, or MSG. John Wm Macy – They make crispy layered cheese crackers and cheese sticks. I purchased their crackers when we were in New York last summer and I buy similar looking nut free crackers at Trader Joe’s and we eat the entire box. They’ve introduced convenient to-go bags of bite sized crackers this year. Landcrafted Food – They make delicious premium meat sticks in their own dedicated facility. The beef sticks are gluten-free, do not use MSG or nitrates, are flavored with organic cane sugar and salt and lower in fat. What’s really amazing about this company is that the owners already have a successful business selling their humanely and sustainably raised 100% grassfed, no hormones, no antibiotic, premium cuts of meat to Washington DC area restaurants. They help local small family famers by buying cattle their cattle that are raised the same way to make beef sticks and provide steady income for the small farms. Brantley Ivey, one of the owners watched me taste a sample and he must have read my mind (tender, flavorful, not fatty tasting, really good) and mentioned that they make the meat sticks from ribeye (wow!). Their products are available to order on Amazon (affiliate). Mr. Espresso – My first sip of their latte reminded me of lattes that I used to order while at Berkeley. It turns out that my favorite cafe was one of Mr. Espresso’s customers 30+ years ago. Mr. Espresso mostly sells espresso equipment and beans to restaurants and cafes but if you love coffee and make your own espresso at home, you might like to try their beans. I didn’t specifically check whether they are nut free so please check. This was my sentimental favorite. Otto’s Natural – They make a gluten free, top 8 allergen free cassava flour, made from yuka, a root vegetable. I haven’t tried baking with it but the samples were amazing and tasted like a regular baked good made with wheat. Proper Crisps – potato chips that are more like kettle chips, they’re super crispy and made with just potatoes, oil, and seasonings. Their Cider Vinegar and Sea Salt and Rosemary and Thyme are my favorite flavors. They also make award winning crisps using kumara, a New Zealand sweet potato. Gluten free, non-GMO, no MSG. They told me that they are also nut free but given their simple ingredients, I didn’t ask about potential cross contact. This was my family’s most favorite new ready to eat snack so I will be looking for them in health food stores or asking my local Whole Foods Market to stock them. Wasa – they make nut free crispbread, they have a new gluten free crispbread that tastes great. It’s has a nice texture and flavor. I love that each box has mini-packs 3 crispbreads. They have a clear allergen statement available in their FAQ section. I love it when companies are so transparent! Zetlian Bakery – Their breadsticks look exactly like the ones I buy from Trader Joe’s so I stopped to ask them if they are nut-free. Yes! They also make falafels, pizza crusts, calzone, and empanadas in their own facility. I love that their website mentions that they keep their facility clean and free from cross-contamination, which is different from cross-contact, but still important. If I ever find their other products in stores, I would check about cross-contact issues in greater depth. Navigators use radars to find their way and allergy families develope a finely honed “Allergen-Dar” to keep their loved ones safe and healthy. We can read labels but sometimes that’s not enough if there isn’t an allergen advisory printed on the label. It’s exhausting and I can’t check everything but there are some high-risk foods which I prioritize. I noticed that there are some trends which are worth mentioning. Watch for nuts in unexpected places. I had a sample of an exfoliating scrub made with walnut shells in my bag. Check non-food products for allergens, sometimes they might use scientific or Latin words to list allergens. Plant based versions of foods might contain unexpected allergens. Companies want to innovate and create healthier and sustainable plant based foods to eat which is wonderful. But they might use different ingredients to create familiar foods such as cheese made with cashew milk instead of cow milk, vegan jerky made with soy, etc..
Aseptic Packaging & Allergens Have you ever wondered why a box of vegetable soup would have allergen advisories for nuts? I learned there are very few aseptic packaging facilities in the US because they are very expensive to build. So it’s possible that containers of nut milk are packaged on the same equipment as vegetable soup or shelf-stable tofu. Be wary of heat and serve appetizers or pastries. There were many manfacturers of heat and serve appetizers and pastries. Most of them handle top 8 allergens in their facilities. Some private label brands, restaurants, and caterers might use similar products so please check. Check all the flavors. One company makes flavored cotton candy, such as strawberry shortcake or pina colada cotton candy. But they also make a peanut butter flavored cotton candy using powdered peanut, which creates potential peanut cross contact unavoidable. When trying any new foods, be sure to look at what other flavors are available and consider whether there is possible cross-contact. 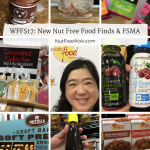 I’ve shared my nut free food finds at WFFS18, consider it a short list of possibilities that might work for your family. They may contain other allergens that won’t work for you because we all have different food allergies and comfort levels. When you call companies with your food allergy related questions, they learn about your concerns and are better able to understand how they can meet your needs. So please reach out to food manufacturers, the very best companies will stand out as allergy friendly stars. Lastly, please let me know how can manufacturers help keep your family safe? Are there criterias which reassure you that the foods you buy are allergen safe? Are there any safety certification programs that you trust? Answer in the comments! For baked goods and other high-risk foods, I only trust companies that clearly state on the package that they are completely free of tree nuts and peanuts. I do not trust companies that state “good manufacturing practices” or respond to queries about allergens in the manufacturing plant by stating that they always provide advisory labels, such as “may contain” if there is a risk of cross contamination.